These delectable crêpes filled with chocolate hazelnut spread and topped with orange-flavoured whipped cream will instantly transport you to Paris! To make crêpe batter: Add eggs, milk, flour, orange zest, vegetable oil, sugar and salt to blender. Pulse until smooth. Alternatively, whisk batter by hand. Let batter rest in fridge for 30 minutes. Heat 8-inch crêpe pan or non-stick pans over medium heat. When pan is hot. Light brush with oil. Check the consistency of the batter. It should be the consistency of cream, thin the batter with 1 to 2 tbsp. of water, as needed. Pour a ladleful of the batter into the pan, swirling the pan to ensure only a thin layer of batter covers the surface of the pan, and pouring any excess batter back into the bowl. Cook crêpes until set and lightly golden brown, about 1 to 2 minutes. Flip and cook until lightly golden brown, about another 1 minute. Makes about 8 crêpes. Whip cream to stiff peaks. Stir in icing sugar and orange liqueur. Set aside. 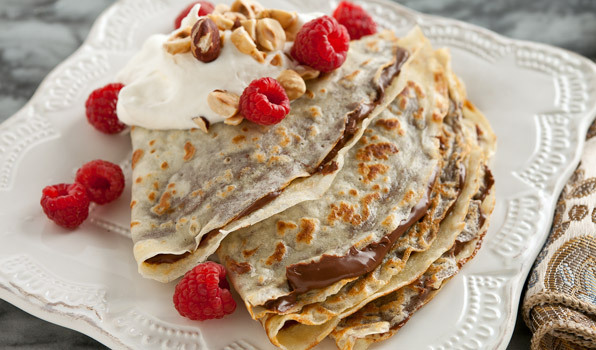 Spread some hazelnut chocolate spread onto each crêpe. Fold each in quarters and serve 2 per person. Garnish with the orange-flavoured whipped cream, hazelnuts, raspberries and dust with icing sugar.